Reassuringly skeletal and free of impurities, the debut album by Belfast-based band Wookalily packs a tough punch to belie its status as a record stripped back to the bare bones of roots sentimentality. ALL THE WAITING WHILE has been simmering for a couple of years before emerging in a form, dark in places but always enlightened by a warm glow of excellence. The belief in organic growth and recognition from the International Bluegrass Music Association has steadied the rise of this four piece band creating a solid platform for an explosion of praise from across the British Isles and farther afield. 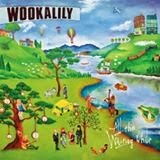 The mystically named Wookalily has been a flowing feast of musical talent and this album represents the past as the band prepare for the future. 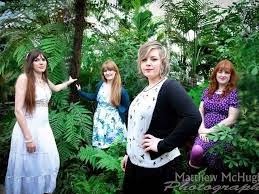 Adele Ingram (guitar, vocals), Louise Potter (percussion), Sharon Morgan (banjo) and Lyndsay Crothers (lead vocals) are the core of the current line up but four other lead vocalists appear on this twelve strong collection of songs entrenched in old time, bluegrass and roots lore. This does create a flavour of vocal diversity threaded by a quality that never wanes. The album’s finale see all vocalists celebrate in full collaborative manner with the gender induced ‘The Devil is a Woman’. A clever line from this song, ‘Lucy-fare -well-go to hell’ illustrates the sparkling writing of Adele Ingram which illuminates all but one of the album’s tracks. Adele’s literary compositions court attention and scrutiny to reveal wit, love, recollection and sadness, ranging from sharp, cute to downright sassy. For instrumentation description, take your pick from any type of roots implement and you’ll find banjo, mandolin, fiddle, Dobro and guitar finding their niche. The album is vibrant with appealing melodies adorning both verses and choruses with equal measure. Standout tracks will fluctuate according to mood with ‘See Me For You’ being a repeat candidate. With a striking resemblance to the spiritual anthem ‘Oh Mary Don’t You Weep’, the strength of the song towers amongst a sea of other giants. The beauty of ‘Diamonds on Gold’ alerted the IBMA of the girls’ talents and an invite to Nashville followed as well as the opportunity to record a respected Dixie Hall song,‘To a Dove’, for a compilation album. Alas this song is not on the debut album although a download code is available on the physical cover. Other notable songs which do make up this superb collection include the bluesy ‘Black Magic Doll’, the waltz influenced ‘Got Me on My Knee’ and the evocative ‘Memories of New Orleans’, assumingly the latter is based on personal travels. ‘Banjo Blues’ sees Adele’s writing at its cutting best while ‘Johnny Kicked the Bucket’ is a fun packed number graced with a great fiddle finish. The only non-penned Adele song is ‘Fire Below’ which comes across as a racy bluegrass standard, while album opener, ‘Hands Pass in Time’, and one of several sang beautifully by current vocalist Lyndsay Crothers, is rich in string and sets the tone perfectly. Like all debut releases, ALL THE WAITING WHILE now gives the band a tangible opportunity to get heard across the country, roots and Americana community in the UK, possibly into Europe and in the US as well. Backing this up with a live presence will also serve the band well and the name Wookalily will also play its part in growing awareness. Ultimately the ladies have produced a record true to the core, wide in appeal and aiming straight to recognisable status. A fine achievement for a debut record.